Allergy sufferers: Are always looking for the best pillow for your restless nights? SmartSilk has you covered! SmartSilk is certified asthma & allergy friendly by the Asthma and Allergy Foundation of America and the Asthma Society of Canada. Goodbye sleepless nights and welcome to a comfortable relaxing night sleep! I am speaking by experience and my daughter’s too. We had the opportunity to test two queen size SmartSilk pillows! I put one in my daughter’s room and took one for the purpose of the review! The pillow is very soft. I usually don’t like soft pillows because it feels like my head bumps into the mattress but I love this one. When I lay down, it is the best feeling ever: as if my head touches the sky, or as if I am sleeping on the beach: I feel relaxed! It is a very comfortable pillow. I also like that your head doesn’t leave a dent in the pillow so I don’t have to toss it to make it even! My daughter is also excited about her pillow. I noticed that she slept better at night! She has allergy problems and snores during her sleep! Although her snoring didn’t go, it was less! She was breathing better! She sleeps so comfortably that I have hard time waking her up! One of the best things about this pillow is that it acts as a natural barrier and repellent to mites! 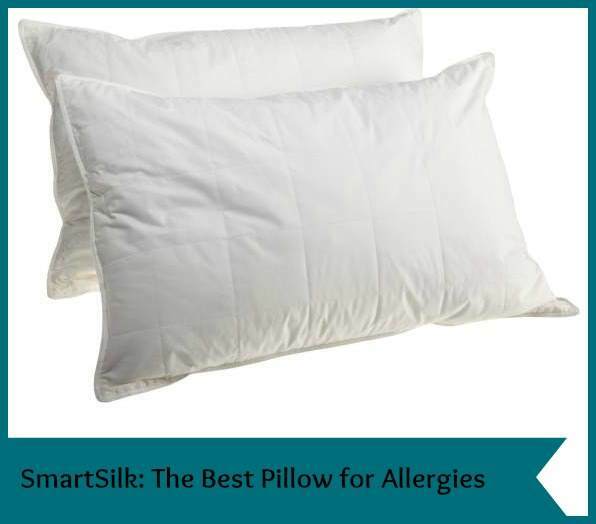 Buy it: Purchase a SmartSilk pillow in a variety of sizes from the SmartSilk website. Connect with SmartSilk on Twitter and Facebook to keep up with news and specials. Disclosure: Our Family World was provided with samples to help facilitate this review. Our opinions are our own. What is it that repels the dust mites naturally? Have tried lots of different stuff my whole life since I have asthma and allergies this would be amazing if it works. SmartSilk Comforter looks good , of course I like it. Nice pillows. I would love the SmartSilk Comforter too. Thanks for having this contest! I like the SmartSilk™ Complete Bed Set. 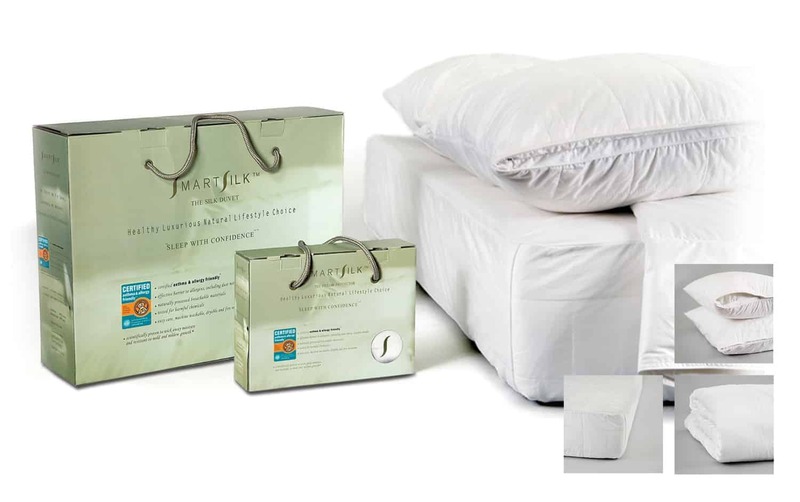 SmartSilk™ Mattress Pad. Silk filled. Sounds luxurious. The mattress pads sound excellent. I like the complete bedding set in queen. I really like the complete bedding set. I would love to get the complete bed set! My husband has really bad allergies and since we lost our house and everything it would be a blessing to win this! The complete bedding set looks great! I like the mattress pad. I would love the complete bed set. I love the comforter that reduces night sweats! Would love to have a SmartSilk™ Comforter. I would also like to try the queen size Duvet/Comforter — it looks very nice! I absolutely would LOVE to have the SmartSilk™ Complete Bed Set!!! Another product of theirs that I like is the Mattress Pad. I love the complete bedding sets on Smart silk. I would love to have a SmartSilk Comforter. I’d like to try the pillow protector, too. I love the duvet cover! I love the duvet comforter. I love the Smartsilk Duvet! I like the SmartSilk™ Comforter. The Mattress Pad is good to have. The complete bed set looks great! i love smart silk complete bed. I really like that they’re asthma & allergy friendly. I love the mattress pad. I like the pillow protectors and mattress pads/covers. I love the SmartSilk Complete Bed Set. I always liked using Mattress pad, and would like to try out Smart Silk. The mattress pad would be super great for my new bed i’m getting! I love the mattress pads! I also love the Duvet/Comforter! I’d love to be wrapped up in that! I love the Duvet / Comforter. Looks like it is so comfy. I would love to get the complete bedding set. I want the complete bed set. I love the smartsilk comforters! I like this: SmartSilk™ Comforter. I like the SmartSilk Complete Bed Set! I like their crib sets! and that they are hypoallergenic! I love the SmartSilk Comforter! The pillow sounds like the perfect thing for my husband to have for better sleep. The duvet looks really comfy and luxurious. The SmartSilk™ Comforter! With our dog sleeping with us every night, we definitely need one of these! I’m going to dream big and say that I like the SmartSilk Complete Bed Set… super set!! I love the luxury of a duvet but the mattress and pillow protectors are really practical items! I love the Smartsilk Comforter..looks so comfy and cozy! i think i would love the bedding, its silky and very cooling and i get so hot at night! I would like the Matress Pad! Couldn’t access site. Link brings up window that says,” 500 Internal Server Error”. I’d love their SmartSilk Comforter. Thanks! I’d like the Complete Bed Set. I like their SmartSilk Comforter! SMARTSILK IS THE ONLY MANUFACTURER TO BE CERTIFIED ALLERGY AND ASTHMA FRIENDLY. I also like the mattress pad. Gosh, now I want a Smartsilk Comforter! I like the Smart Silk comforter. It looks so comfy! I would love the SmartSilk™ Complete Bed Set! I would love to have the comforter bed set. Love the comforter! I feel like that’d be a huge relief to my allergies, as I sneeze while typing this. I want the comforter. I wash mine daily because of my allergies and would love one that has less upkeep and would keep me from sneezing all of the time! I WOULD LOVE TO HAVE THE SHEET SET-VERY NICE-THANKS! Who couldn’t love those duvets! Wonderful. I like the Queen Comforter / Duvet bedding. I would love to try the duvet. I would love to get the Complete Sleep Set! I’d love the SmartSilk™ Mattress Pad for a Queen size bed. i like that they’re asthma & allergy friendly. very cool! I love that these pillows will help me get a better, more restful sleep…something I need with a 6-month old! Id love to try this pillow, Im always buying pillows thinking they will be soft enough but arent when I try to sleep on them.